The summer months are a time for many of us to recharge the batteries, but it doesn’t mean life at Bowdoin grinds to a halt. The campus may be quieter than usual, but there has been no shortage of activity—academic and otherwise—among the Bowdoin community since the school year ended. Here’s a look at some of the key events that have been happening, both on- and off-campus. The Roux Center under construction over the summer. Summer is a great time to tackle campus construction work, says Director of Capital Projects Don Borkowski. This summer has been particularly busy, he explains, with more than twenty-three projects being undertaken, including work toward the completion of the Roux Center for the Environment, the second phase of improvements at Whittier Field, and renovations at Boody-Johnson House. 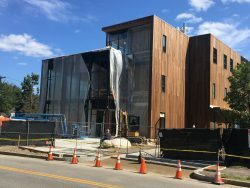 Planning continued over the summer for new lab and convening spaces at the Schiller Coastal Studies Center, and the College is days away from breaking ground on four new residences for upperclass students on Upper Park Row. 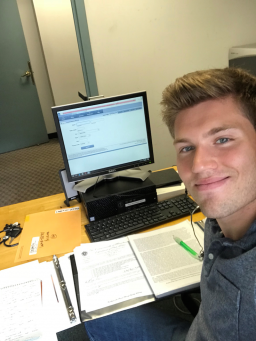 Connor Downs ’20 interned with the Massachusetts State Police Homicide Investigations unit, supported by a funded internship grant from Bowdoin. Nearly three hundred students remained on campus over the summer, some working as college employees, some as funded interns, and some as summer research fellows. A total of seventy-eight students were awarded grants from Bowdoin’s funded internship program, enabling them to pursue exciting work experience opportunities that would otherwise be unpaid. This year’s group includes one student building a new aquaculture farm at Bowdoin and another interning with a state police homicide unit in Massachusetts. A further 200 students have benefited from institutional fellowships from Bowdoin this summer. Some of these grants support environmental or community-service internships with nonprofits. The majority, however, allow students to devote themselves to research that will lay the foundation for senior-year honors projects. A number of fellows were working in science labs, collaborating with faculty on larger research endeavors, while others were tucked away in Bowdoin’s library, following a trail of sources to address a question no one has yet answered. While many of these fellows and funded interns stayed local, others took off to live and work around the country and the world. Destinations this summer included China, Finland, and the Caribbean. 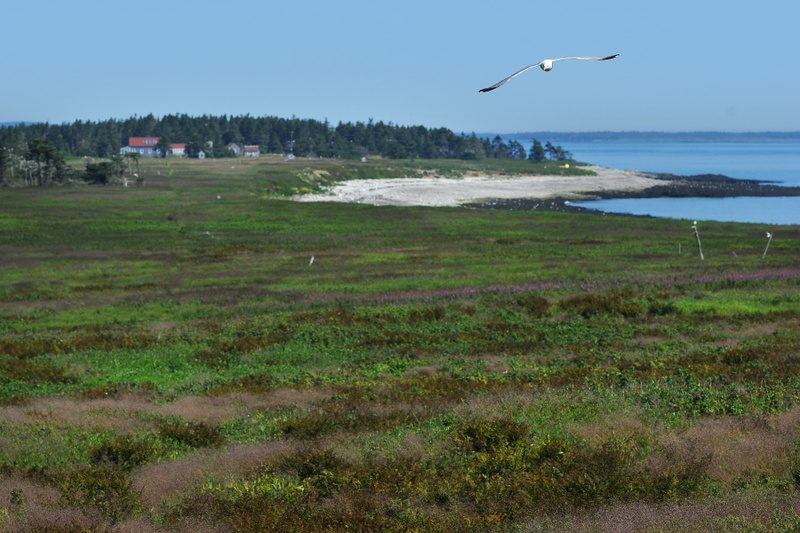 One regular highlight of the summer is the annual trip to Kent Island, a College-owned nature reserve and field station in the Bay of Fundy. For decades, a handful of students have been spending up to nine weeks of their summer on the island, pursuing a variety of mostly ecological research opportunities. Subjects tackled by this year’s cohort of eight students included seabird behavior and rockweed harvesting, while two of them—a poet and a painter—came as artists-in-residence. Faculty have also been keeping busy pursuing their own research over the summer, while many of them have also supervised students on a variety of fellowship programs. The Gibbons Fellowships, for example, involved eight faculty and eleven students working on projects that use technology to explore interdisciplinary areas and to develop fresh approaches to the study of complex problems. Projects included a digital survey of political cinema, building an app to help students learn Greek, and using drones and infrared sensors to study changing salt marshes in Scarborough, Maine. Among the many examples of faculty research this summer are the following: Associate Professor of Earth and Oceanographic Science Emily Peterman took a trip to Greece in June. She and a couple of student researchers carried out geological research, thanks to a grant from the National Science Foundation. Her colleague, oceanographer Collin Roesler, embarked in August on a thirty-seven day trip to the Gulf of Alaska. 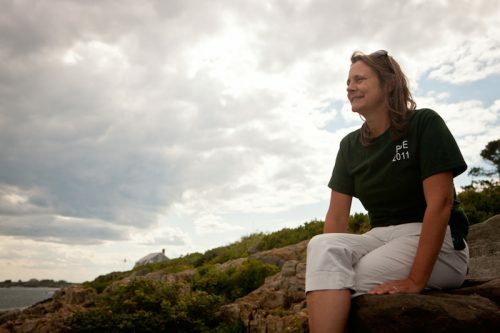 She has joined a community of fellow scientists in a venture funded by NASA and the NSF to study the ocean’s plankton and bacteria and the role play they in climate change. In a Bowdoin-funded trip across the Atlantic, Geoffrey Canada Associate Professor of Africana Studies Brian Purnell went to London to research archives relating to the colonial government of New York in the 1700s. He also presented a paper at a conference of historians at Cambridge University. A group of fifteen incoming first-year students arrived on campus on July 7 for an intensive six-week pre-college program. As Geoffrey Canada Scholars, they are part of an inaugural program set up as part of the new THRIVE initiative, funded by Netflix CEO and co-founder Reed Hastings ’83. The aim is to help students who are traditionally underrepresented at Bowdoin, many of whom are first-generation college students or students from low-income backgrounds. A strong contingent of Mellon Mays fellows launched ambitious research projects this summer, led by two former Mellon Mays fellows and current PhD students, Golden Owens ’15 and Kris Klein Hernandez ’12. The Andrew W. Mellon Foundation established its international Mellon Mays Undergraduate Fellowship Program in 1988 to increase faculty diversity in higher education. This year’s fellows include five Bowdoin undergraduates, as well as students from Smith College and the University of Witswatersrand in South Africa. As the program’s two current faculty members, Owens and Klein Hernandez not only helped students launch ambitious undergraduate research projects, but also prepared them to succeed as graduate students and tenured professors one day. 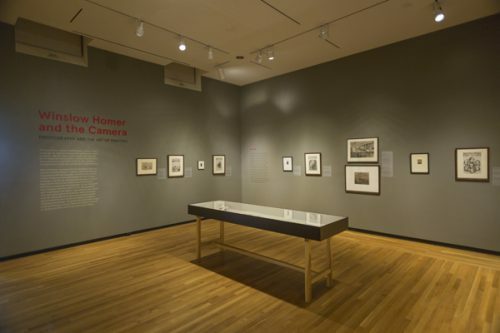 Installation view of “Winslow Homer and the Camera: Photography and the Art of Painting” at the Bowdoin College Museum of Art. Photo: Dennis Griggs. The campus has been a hive of cultural activity over the summer. On June 23, the Bowdoin College Museum of Art presented Winslow Homer and the Camera: Photography and the Art of Painting, the first exhibition to look at the role of photography in Homer’s artistic practice. The much-anticipated show brings together over 130 objects by the artist across all mediums, ranging from master paintings to oil studies, drawings, prints, and photographs, created in the United States and during his travels overseas. By August 19, a total of 11,367 happy patrons had attended the exhibition, which runs until October 28, 2018.